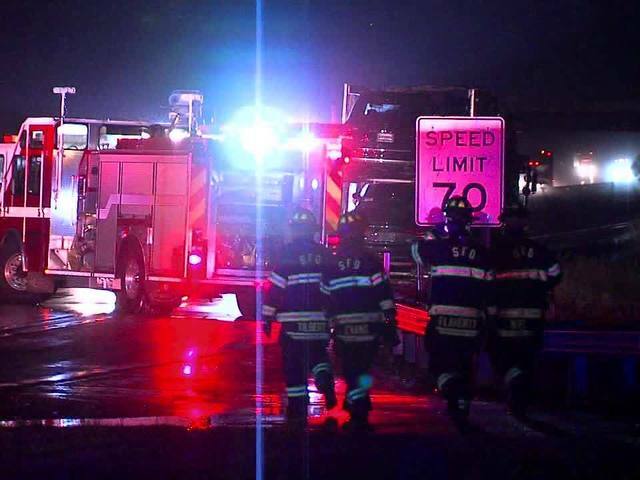 All westbound lanes of the Ohio Turnpike in Strongsville were closed late Tuesday night into Wednesday morning after a car hauler caught fire. The fire started as a tire fire on the semi hauling a load of cars just around 10 p.m. Tuesday in front of the Ohio Turnpike Headquarters at the 159 mile marker. Ohio State Highway Patrol Troopers said the driver was able to get out of the semi and was not hurt. The fire spread and destroyed 5 of the dozen or so cars on the trailer, according to troopers. The left shoulder was the only lane open to traffic until just before 12:30 a.m. Wednesday when the left lane was opened to traffic. The right two lanes were being kept closed while a clean up company and tow company worked to clean up the mess. The entire scene was expected to be cleaned up before daylight Wednesday.